The week consisted of six presentations relating to a hypothetical MASS-related collision of the east coast of England, exploring a range of issues related to the new era of smart shipping. Delegates from the P&I sector were asked to participate in a survey on the emergence of MASS. The results showed that, from a P&I perspective, there was work to be done to surmount the regulatory, legal and insurance challenges presented by new MASS technology. After years of blue-sky thinking smart ships have become a reality. HFW asked how quickly MASS technology was being adopted and implemented in the maritime industry, given that profitability would be a prime concern for companies? 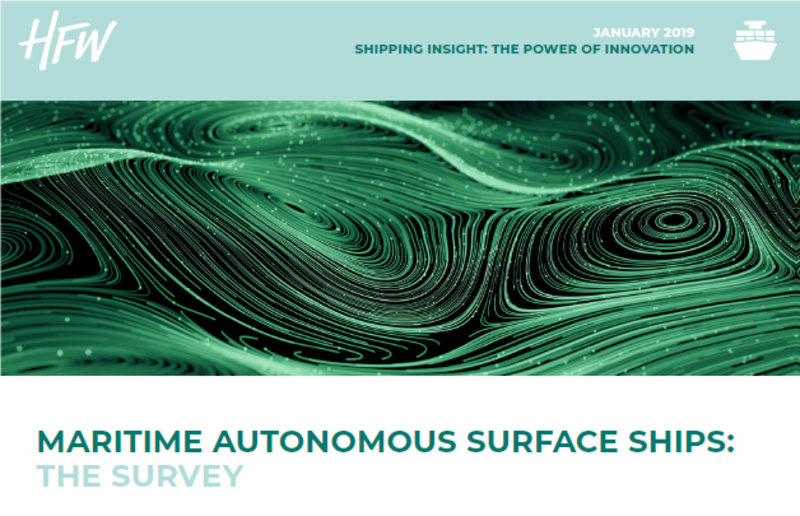 Almost half of P&I sector survey participants stated that MASS would start operating within international waters within the next five to 10 years, with nearly 30% of participants predicting that autonomous shipping would represent more than 20% of all global shipping within 20 years. HFW noted that, with the P&I sector predicting that demand for MASS would grow substantially within the next two decades, it was no surprise that 96% of respondents thought that MASS and conventional manned vessels would (and indeed would have to) operate within the same water space. Some respondents suggested that MASS could be confined to distinct international trading routes, outside of “traditional” routes. HFW said that the implications of MASS technological advances were enormous, presenting challenges to the existing legal structure and regulation, and 81% of survey respondents said that regulatory preparedness was of pressing concern in the industry. Fully 87% felt that the lack of clarity in legislation on MASS had an impact on the provision of insurance for these vessels. When asked to comment on their preparedness for the emergence of MASS technology, 55% of participants said that their business was not prepared, with only 21% reporting that they were nearly or fully prepared. That said, when asked whether regulatory preparedness for MASS was “a pressing concern in the industry”, only 19% said yes, with the rest saying no. HFW noted that currently more than 75% of marine accidents were the result of human error, and whilst MASS would not remove the need for human input completely, the need for seafarers would be reduced. Although one of the benefits of MASS was a likely reduction in seafarer error, fewer than half of survey respondents thought that the emergence of MASS would lead to a reduction in notified claims. Some 35% envisioned that notified claim numbers would remain the same, while 23% said that the number of notified claims were likely to increase. HFW said that the shift towards autonomy would require new ways of diagnosing and dealing with issues; a rapid real-time communication infrastructure between MASS and control centres would become essential if MASS were to be truly ocean-going. And while autonomy had the potential to reduce the capacity for human error, it created new risks by placing reliability on connectivity, and would necessitate a rethink of how existing maritime rules and regulations were to be interpreted. HFW said that cyber security would be central to this, and 52% of participants felt that cyber risks, presenting a unique threat to MASS, were preventing their members from investing in autonomous technology at present. The manner in which standard P&I cover currently operated in the event of a cyber-attack might have to be reconsidered in the context of MASS, many respondents said. One commentator stated that “cyber exclusions will need to be removed and solutions found”. Survey respondents argued that regulatory and legislative developments would be needed within the industry, in addition to training and education, before MASS could be fully utilized. When asked what other changes were needed in the industry in response to the increased utilization of MASS the respondents raised a wide range of issues. Some queried how MASS would respond to the international obligations to assist others in distress at sea, while others highlighted the inevitable geographical and infrastructure-based challenges, including ports, repair facilities, and cargo handling.